Love you Arnab. Because you questioned Sushma Swaraj as well as the Gandhis. 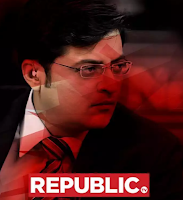 Never wanted you to stoop to the level of another Tehelka (Tehelka & NDTV are news organisations with biased & one sided journalism that produced pro government news content during the UPA 1 & 2 regimes.But your channel is reported to have been telecasting only one sided content.You might win the TRP game. But this isn't the journalism for which you were respected for.You have to question the government for it's shortcomings, be a watchdog and oppose corruption on both sides of the spectrum.